The mite B team participated in the outdoor classic tournament in York this past weekend. They had a long weekend of early morning games on the outdoor rink at Hills. The boys faced some really tough teams, most who play in a division above them. They worked hard and made it to the championship game but fell short by one point. Despite some questionable calls and some rough physical play by the other team the boys never gave up. The coaching staff couldn’t be prouder of how hard these boys are working and this weekend was a good learning experience when it comes to losing. The team is gearing up for what will prove to be another tough game against Lehigh Valley next weekend. The Montgomery/Stoltzfus/Bradnick Team had a great time at the outdoor tournament in York. These players are continuously improving and having fun. Many of our players took advantage of the 3-day camp, run by Garrett Shultz, coach of the junior team. Our players spent the week working on their skills and logged 20 to 25 hours of ice time that week. We look forward to getting back to league play Saturday with a home game against Cap City and then a non-league game Sunday at the Jr Flyers in West Chester. The 12Us took the show on the road as they continued a multi week stretch of tough opponents. Saturday they traveled to Bucks County to take on the 5th place, 10-5 Warwick Wildcats. The Panthers struck 1st just 2 minutes in as Nicholas Michener sniped one off the inside of the post and into the back of the net assisted by Ethan Addy. The Wildcats struck back 4 minutes later to tie the game, but the Panthers went up 2:1 as Jack Gibbon scored assisted by Asher Putt. The wildcats evened it up with less than a minute to go in the first. The 2nd period has been a tough period this year and the last-minute Wildcat goal to end the first could have easily spelled disaster but not this game. The Panthers dominated the second period with 2 more goals by Gibbon, one unassisted and one assisted by Michener. Michener ended the scoring on the second with an unassisted short-handed goal and the Panthers were up 5:2 headed into the 3rd. Despite being a full line short in skaters the 12Us dug down deep and were determined to not give up the lead. Gibbon added two more, the first assisted by Scott Fleming and Ethan Addy and his fifth of the game assisted again by Addy who had three assists in the game. The final score was a big 7:4 win for the Panthers. Despite some chippyness in the third the Panthers remained disciplined giving up only one power play in the game which they killed successfully. Logan Donnelly was a bit under the weather but made 19 saves in the victory. This was a very dominant win and great team performance against a tough opponent to go into the holiday break. The 14s played played in the Travel Champs Hershey Christmas Tournament over the past weekend. The team roster was a bit short-handed missing 3 and then 4 players – with that in mind, they invited a couple of the 12U players to help. 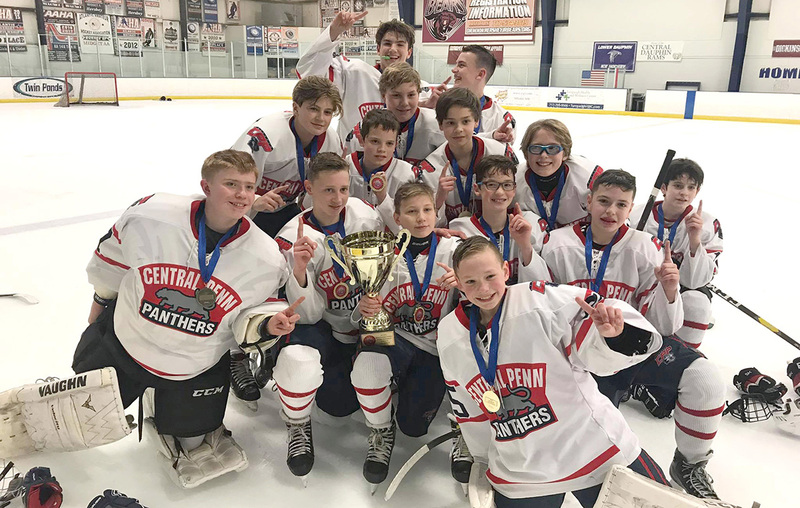 With just 12 skaters for the majority of the weekend, the kids played fantastic on their way to the Bantam division Championship. In the Finals on Sunday the 14s played host to the Reston Raiders (from Virginia). The two teams were a great match-up, so well matched that each team only allowing 2 total goals in the qualifying rounds, and the number one seed was determined by penalty minutes. The Raiders carried the play early in the first period, and scored first, marking the first goal that Panther goalie CJ Ulmer have allowed in the tournament. Not long after that Jack Gibbon notched his first goal of the weekend to tie the game at 1. In the late in the second period Shane Lutz put the Panthers up 2:1. The Panthers would carry the lead into the third when Jaden Hurst added an insurance goal on the power-play (assisted by David Ward and Lutz). Both Lutz and Hurst added empty-net goals (bookending a Raider goal) to seal the Championship game 5:2! The team played great this weekend and had a great time – keep up the hard work boys. The 18u Team only had the weekend off, and a fun practice on Thursday. Members also helped run the 12U & 14U practice on Thursday. The boys have two huge games coming up this weekend as they try to continue their march up the league standings. The 18 team is holding a Sub Sale Fund-raiser. If you are interested in purchasing a sub – please see one of the players or parents before January 11 for details.